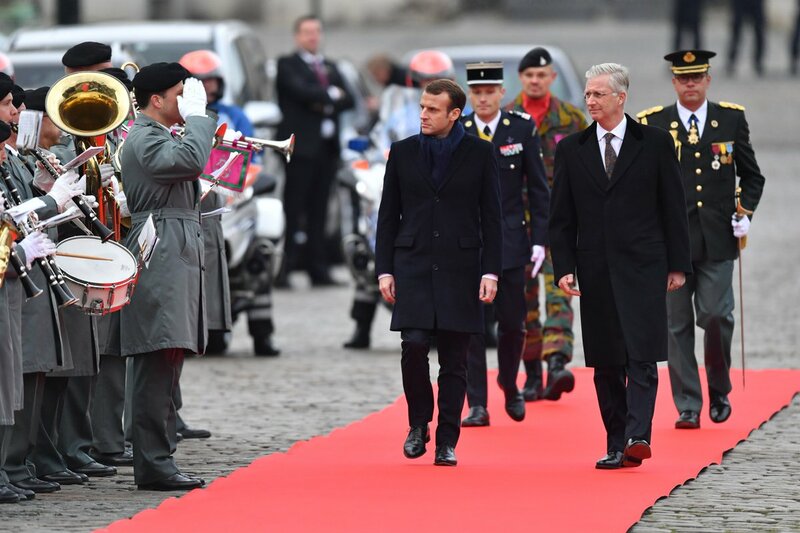 After the invitation of the King Philippe and the Queen Mathilde, the President of France Emmanuel Macron and his wife make a State visit to Belgium. "Monday's program includes a welcoming ceremony on the Place des Palais in Brussels, a visit to Ghent (the MSK Museum of Fine Arts) and the Town Hall) and a state banquet in Laeken. . On Tuesday they will go to Molenbeek (The Valley) and Ittre (The House)"
Interesting that Molenbeek is on the agenda. Usually a State Visit is to show the best and the most beautiful of one's country to the distinghuised guests, but Molenbeek is a very paupered part of Brussels, often named a hell-hole and the cradle of the jihad. Many of the terrorists from the Paris attacks came from Molenbeek. A most remarkable choice to bring Monsieur le Président and the Première Dame to that filthy, graffiti-clad, depressing part of Brussels. But maybe the President will be shown urban renewal projects, which maybe will be a ray of hope for the plagued residents of Molenbeek. It remains a remarkable choice to bring a visiting head of state, during a State Visit, to such an area. Molenbeek is also an up & coming part of Brussels with great hubs for young entrepreneurs etc. It's much more than what some media have tried to portray it ("hell hole", please ). I'm often in Molenbeek for work and I've never felt unsafe. It's just part of a big city. Philippe & Mathilde have given extra attention to this part of the city because it's been treated very unfairly. Often the poor, underdeveloped parts of a city is also the one with a vibrant art scene, small shops, local artisans and have many young professionals moving in to take advantage of both the hip surroundings and also the affordable housing. Yes, even in the desert, there are flowers blooming. But okay, the President wants to revive the banlieues around the big cities in France, so maybe he will be curious how Molenbeek deals with the serious urban and social problems it faces. I have been in various Brussels municipalities like Jette, Molenbeek, Sint-Joost, and phew... it was really like a switch, entering a total different world. I hope the best for these cities, that they can find the key to renewal and rejuvenation. It is very urgently needed. The focus will be a former industrial laundry site in Molenbeek, which is in transition to a centre for the arts and the neighbourhood. If I was the Belgian host, I would have shown competitive and innovative companies like Showpad or Larian Studios in Ghent, MediaGenix in Brussels, IMEC or Layerwise in Leuven, or the gigantic data centre in Saint-Ghislain. But ok, apparently other choices are made by the proud (?) hosts. Nice ceremonial with the mounted escorte and a gentle handkiss from the President to the Queen. I am surprised by the everyday camouflage dress of the guard of honour. No ceremonial uniforms? Madame Macron looks trés elegant. I like her ton-sur-ton grey with autumnal colour accents. Madame Macron looks trés elegant. Yes, that is odd, but the mounted guards wore ceremonial uniform. I have a feeling that the Belgians are always on the low side on protocol. Even in the funerals of King Baudouin and Queen Fabiola, the honor guard did not wear ceremonial uniform. I am looking forward to the state banquet and to seeing if Queen Mathilde will wear the full version of the Nine Provinces or only the base. I think you are right, at the weddings and the funerals I have not seen ceremonial uniforms, apart from the mounted escorte. It is expensive to have a depôt for uniforms for thousands of guards, but it is only a fraction of the costs of one Leopard tank. Can somebody translate what the protesters are saying, please? According to the site owner, they were shouting "België Barst" and "Weg met de monarchie". Later, some royal fans responded shouting "Leve de Koning". Which means: 'Belgium Breaks' and 'Away with the monarchy'. According to Wim Dehandschutter these people are members of 'Voorpost', an organisation that is active in Flanders, The Netherlands and South Africa and that wants to form the 'Greater Netherlands' by a unification of Flanders and the Netherlands. Within Flemish nationalists they belong to a very small fringe group. The king will be used to these protestors -as they have been doing these kind of -very small- protests for two decades or so. A morning suit is a jacquet and that is day wear. Or do you mean: the same suit as this morning? I hope the president will wear black tie or white tie.